It is an open secret that the first love affair of the late heir to the Austrian throne was with a beautiful young Italian singer, Mlle. 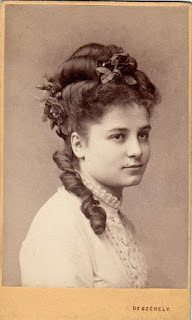 Emilia Tagliana. She was the pupil of my dear old Maestro Lamperti, and studied with him in the Milan Conservatory. After a novitiate in a few Italian theatres, Mlle. Tagliana was engaged at the Ring Theatre (of ill-fated memory), and it was while shed was singing there that the Crown Prince saw, heard and fell in love with this little artitste. They were both very young, and for a time no notice was taken of this youthful Romeo and Juliet, but finally Prince Rudolph declared his intention of espousing (morganatically) La Tagliana, and then, of course, there was trouble. The lovers were at once separated, Mlle. Tagliana being packed off to Italy and forbidden to set foot in Austria, and the Crown Prince sent on a tour of the Orient, guarded by tutors, etc. On his return a bride was ready, and nolens volens he was wedded to the blue-eyed Princes Stephanie of Belgium. La Tagiana in the meantime came down to Lake Como, where she passed the summer, with many others of Lamperti's pupils, of whom I was one at the time. Her romance and her petite, graceful figure, with great melting dark eyes and delicate features, her air of melancholy and sweet, pathetic voice, were all familiar enough to the students gathered there round the old maestro. We regarded her with admiring awe, and, of course, sympathized ardently with her love idyl. After the prince was safely wedded, Mlle. went to sing at Berlin, and finally drifted back again to Vienna. The gossip of that most gossipy city always has it that the prince remained faithful to "love's young dream," so far as he could be and the fair Princess Stephanie was openly jealous of the dark-eyed singer. I do know what became of La Tagliana, as I never saw her again after that one summer on Lake Como. "Rudolph's First Love," The Press, February 24, 1889: page 14. What the annoymous writer of this writer did not know was that Tagliana apparently died in poverty, far from the glittering stage, thoughts of princes and the world of Lamperti. As a coloratura soprano, Tagliana sang the leading role of Carmen with great success. Would that happen today? Not a chance. Meanwhile, the Crown Prince, La Tagliana's one-time lover, ended his life trajectory in suicide.